Spend the night in comfort on a world renowned bird sanctuary! 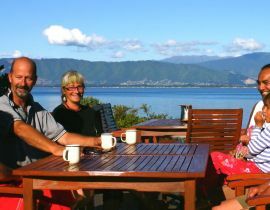 The Lodge on Kapiti Island is more than an overnight stay – it can be a life changing experience. Your stay with us is one of the most unique alternatives to Wellington hotels you could possibly find. We provide a comfortable, relaxing, nature inspired experience in one of the world’s great conservation environments, with genuine Maori hospitality. 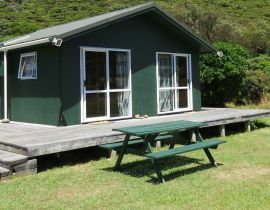 We are the only accommodation provider on Kapiti Island, and offer 3 unique options to truly get the most out of your Kapiti Island experience. Find out more about our overnight Kiwi spotting tour here. Forget about leaking tents and muddy sleeping bags, we take camping to the next level. 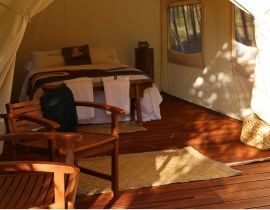 Enjoy your private, secluded corner of paradise in our luxurious tented accommodation. Sitting next to Manuka clad hillsides alive with birdsong, you can bask in the afternoon sun with a glass of wine as our chef prepares your meals. 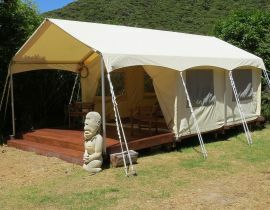 We’ve partnered with Canopy Camping to provide a truly unique way of enjoying Kapiti Island, up close and personal! Our cabins are comfortable and warm, lined with native timber, and nestled in the middle of Waiorua valley at the north end of Kapiti. 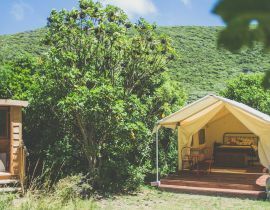 With stunning views of the native bush covered hillsides, and a cacophony of native bird song surrounding you, you’ll feel at home among nature. Single, double, and bunk configurations available. Shared toilet and shower facilities are located nearby. Make yourself at home in our coastal bungalow Ensuite option. 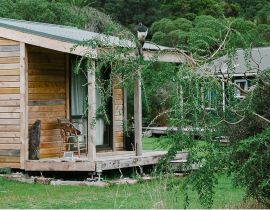 This classic Kiwi bach offers comfort and convenience, and priceless ocean view out across Waiorua bay. With 2 bedrooms, toilet and shower facilities, as well as extra fold out beds available, our Ensuite accommodation is perfect for couples or family groups.